Hi all! Story time ahead, skip to the pictures if you don't feel like reading this haha. I won't be offended. Anyway, I'm currently writing this post at 6 AM after being awake for about 3 & 1/2 hours now. I woke up at night not feeling well and I couldn't go back to sleep. Then about half an hour later, I smell what I thought was gas, REALLY strongly throughout the whole house and I start freaking out. The carbon monoxide monitor wasn't going off or anything, but I was still really worried, so I open the windows and ask my roommate if she smells it too [she didn't at first, so I thought I was crazy lol], then our other roommate comes in and says "Get dressed and leave right now, I think there's a gas leak". Perfect... So we all hightail it out of there just in case our house decides to blow up and wait for the gas man to come. When he gets here, he discovers that there's a back-up in the furnace and oil's been spilling everywhere because our landlord likes pretending he can fix everything [but really just ended up messing it up]. So. Now, we have no heat and it smells like oil. But the good news is that we're safe! Just pissed off haha. For this, I used Love & Beauty "Crystal/Light Aqua" as the base [these names couldn't be more boring], Orly Buried Alive for the tree trunk, and Cult Nails Deal with It, OPI Live and Let Die, and Love & Beauty Green [see what I mean?] for the leafy tree part. And this was done with my make shift dotting tool: a straightened out bobby pin! I can't wait to see the other team's challenge and also how everyone on Team Anne interpreted this! P.S. Happy election day!! Go out there and vote! I'll be glued to various news outlets all day today, so I'll reemerge after the decision is made. kdasjkldsjf, crazy. OMG I am glad you are okay!!! :O That must have been really scary!!! Really cute trees!! So cute. Hope things get better soon hon. Soooo cute Sarah! Way to go! And thank goodness you are safe!!!! This is adorable! I'm glad you're doing ok - that must have been scary! I hope you get heat back soon! 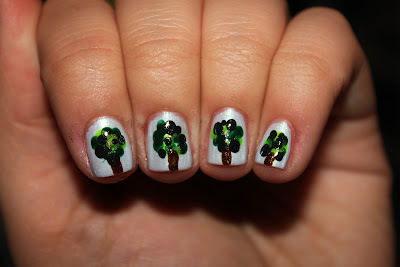 Sarah, these are so, so cute--I love the way you dotted the different greens for the treetops! Cute trees!! Glad you are safe! I'm so glad you are ok, that's scary! It's such a good thing that you smelled it. Hopefully things get better for you and you get some heat back. I love this mani, it's adorable! My first dotting tool was a straightened out bobby pin too. 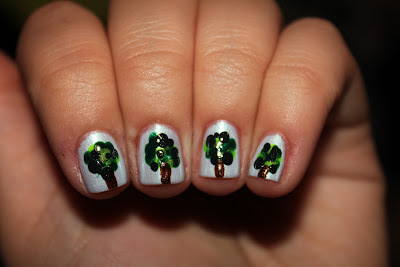 Cute little trees. Glad you are safe, gas leaks are super scary! 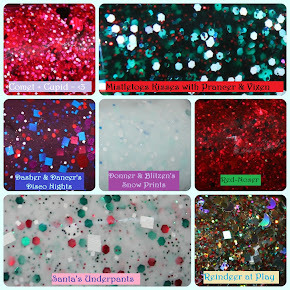 Loving the colors in your mani, it's just too cute! I love this, it is so cute!